It seems we were pretty set on enjoying ALL that there is that is traditional American culture on this trip! 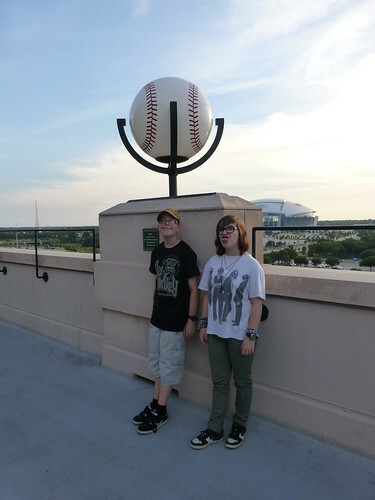 Before we left the big city and started exploring the littler towns in America we wanted to catch a sports game. I’ll be honest, I didn’t care whether it was American Football, Basketball, Ice Hockey or Baseball – I knew whatever we chose would be unlike anything we can get back home. 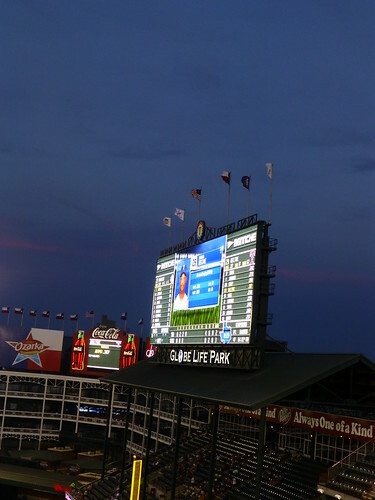 As it was, it was baseball season and there happened to be a game that matched perfectly with our itinerary. 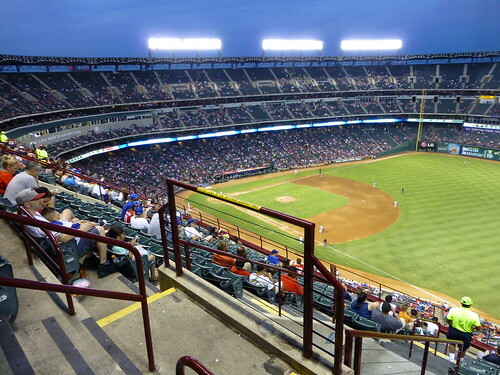 The Texas Rangers were playing the Manta Rays and there was a pretty good turnout at the game – it was busy. It was also a pretty cheap evening for us. I’ve since looked at prices for other sports and it was way higher – very fortuitous. It helped that the person serving us for tickets gave us kids prices for our two even though at least Marcus was too old for that. One thing I’ll never forget, was the standstill of the crowds and everyone, no matter what they were doing, when the national anthem was played. I was coming up the escalator after getting some cash from the ATM and everyone just stopped. Really weird! I know you see it on telly, but being there was a bit surreal – say what you like, but the Americans really do take pride in their country. James and the kids missed it all as they were looking out over towards the Dallas Cowboys Football Stadium – so that was even funnier to me! As for the game – well I was confused from the start! But that was ok, we enjoyed messing around and watching the kiss cam when that came on and all the random happenings over the tannoy. I also learned that ‘tail gating’ is a completely different thing in the US – apparantly over there it doesn’t mean driving super close to the tail end of the car in front of you, but actually means having a picnic style get together out of the boot of your car. So there you go. Travel is educational!